We drink a lot of beer here at The Hop Review. So, we found it only fitting that we share some of our thoughts on said beer. Each month, we share a handful of beers that we think you should know a little more about, through our palate. We've tasted through the following 18 beers for October, and rated them according to our very own interpretation of the BJCP scoring guidelines, on a scale of 100 and in no particular order. We considered aroma, appearance, flavor, mouthfeel, overall impression and trueness to style. It's not an exact science–we know this. We just don't like to pass on the opportunity to drink...more beer. Cheers! A beer for the working class. Light enough to continue on with your day–even after a couple–yet packed with all the flavor you deserve after an honest days work. The kölsh inspired golden ale is a perfect balance of cereal grains, with a touch of sweetness, and mild grassy hops with a soft pleasing finish. Batter up. The name and appearance alone oughta make you want to reach for this shareable brown ale for October (and into November). This 'Belgian-inspired' boozer is a replacement for your ubiquitous pumpkin ale. It's yammy (17 lbs per barrel), spiced, molassesy and all around bold. Another hit seasonal from the Bruery. Fall in a glass. To be honest, we didn't have high hopes for this one but the pleasant sweet malt and honey aroma make for a very drinkable example of the style. There's a candy, caramel-like malt taste that could be a little much for some, so we'd recommend this if you're planning on a short drinking session. The "Fest" beer for those who may be adverse to the traditionally sweeter, rich, malt forward German lager. Vienna malt adds a nice biscuity character, and American hops give it a nice bite–but a heavy dose of rye is the star. Rye three ways adds a nice spice character that works beautifully with grilled sausage and stone ground mustard. In a blind tasting, you wouldn't be able to tell this beer from the best the Pacific Northwest has to offer. Huge notes of citrus, juicy tropical fruits, and pine with a slight alcohol heat, that is somewhat amplified by the citrus. While it may be brewed in London, Bloody Notorious has American craft fingerprints all over it. A good example of the style, this Oktoberfest has a moderate mouthfeel and and a taste that falls right between sweet and crisp. There's also a slight hoppiness on the backend that we find to be a nice changeup from the norm. If Oktoberfests are meant to be drank in large quantities, this would be our vote for a full day of prost'n. 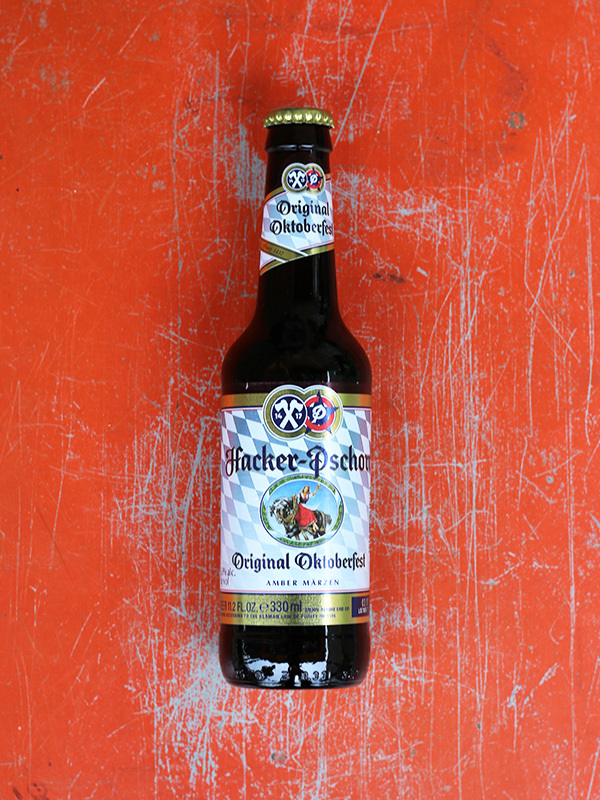 The number one selling Oktoberfest beer during the namesake two week German festival. And at 6.0%, it's slightly higher than the other traditional lagers served. Mellow, easy drinking, yet full bodied–it offers a great contrast to what's expected from an American brewery doing a 'fest' beer. An industry standard. Aromas of cracker and biscuit and a light grainy sweetness with a hint of tropical fruit are clearly present. Mild floral and earthy hop characteristic and a soft lemon finish. There are some good pieces here. But, overall, it seems like there's just something missing to really make this hoppy lager from the famed Banana-beer-makers memorable. As one of only six breweries that pour at Munich's Oktoberfest, Hacker-Pschorr knows what they're doing. Their take on the age-old style is bready and floral with just a touch of sweetness made for a long day of fest drinking. If you're looking for a Märzen that's guaranteed to be "to-style," this is where to start. The original king of craft lagers in the Second City, 'Metro' doesn't miss with its fall seasonal. Rich toasted malts with just the right amount of bitterness for balance and a clean finish. For a traditionally straight forward style, Afterburner is pleasantly nuanced. Perfect to contemplate while sitting around a fall bonfire. A bright clear straw yellow lager, this helles just feels 'classic.' I'd guess this is best consumed in a tall pilsner glass, in a biergarten somewhere. A little dry and spicy, a little herbal and grassy–it's just an all around classic helles. Pour a few, watch that vibrant lager create its distinct head, and hang on to that Indian summer. If Chicago's hometown heros, Revolution, could successfully introduce any first time drinkers to their brand via one beer series, it'd be the 'Hero' lineup. Showcasing single hops in each pass, they are each distinct winners. The limitedly seasonal Citra Hero may get most of the attention, but Mosaic is just as juicy, and just as 'Rev.' Just when you thought it was time for the maltier beers...reach for a Hero. It's interesting to see Sapporo do something new after so many years of the same old thing. With the emphasis on the roasted malt character, slight chocolate aroma, and clean profile, the brewery is clearly trying to place this on the dining room table as a pairing for food other than sushi. For the right price, this just might be a good alternative to other heavier black beers. This is the thinnest bodied of all the Oktoberfest brews we sampled this month. The aroma is true to style and it pours a traditional light copper color, but that's where it ended for us. If really delicate, sweet beers are your Fall jam this might be for you, but it wouldn't be our choice for those dark and dingy October nights. Sweet candied pear is the overwhelming flavor here. And unfortunately so, its a bit too candy-esque to balance your beer drinking. As cider drinkers begin to trend toward drier, more tart ciders, this comes in on the other end of the spectrum. Perhaps a good pool side cooler for the sweet tooth–but not much here for your typical craft beer goer. Made from Rogue Farms-grown Dream Rye, this IPA doesn't hide its intent. It is as rye-forward as you'd hope for a Rye-PA. For a beer style that almost seems to come and go in waves, this one is worth reaching for and sharing this autumn season. It's full-bodied with a distinct backbone, but not so spicy that you feel you can only do one. Cozy up and get to sharing. Closing out our October tasting, sits yet another take on the Oktoberfest Märzen–this time from West Coast meets Midwest makers, Lagunitas. And in true Lagunitas fashion, it's a hopped up take on the classic style. It's malty-meets-hoppy, with a dry woody herbal twist. Unfortunately, this one missed the mark a bit for us. We'll stick to the LBC pales.